Samsung are pretty invested into this wearable tech business. Having already released FOUR smartwatches in the last 6 months, we’re now treated to the Samsung Gear S. With both 3G and GPS connectivity, this is by far Samsung’s best attempt yet. With a curved display the Gear S certainly stands out as stylish, but what does it offer for fitness features? Here’s my thoughts on how this latest wearable could be used to improve your health. Finally! Samsung have decided to pop a GPS chip inside a Gear Watch. This means you can track the distance of your activities more accurately than a pedometer. 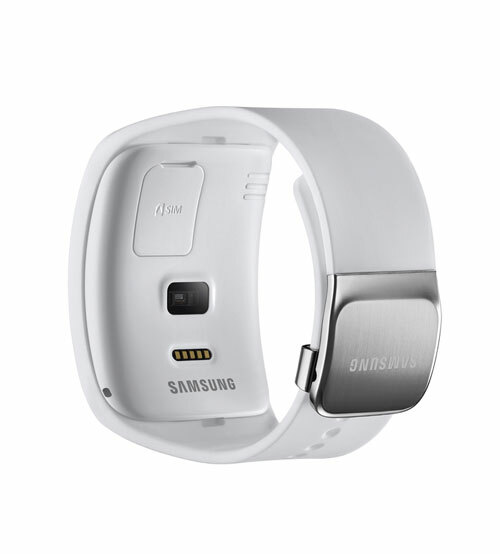 Older activity trackers like the Gear Fit can work out distance ran when connected to a mobile device over Bluetooth, the Gear S can measure all by its self. This places a serious threat to the likes of Garmin who have released running watches for years. Ultimately why would an athlete buy two devices which can practically do the same job challenging GPS watches like the Garmin Forerunner 620 head on, I’m curious to see if a Gear S is as accurate at tracking distance as a Garmin. On top of this, Samsung’s decision to add location tracking within a watch makes it highly likely that we will see an Android Wear GPS running watch within the next 12 months; perhaps named the Samsung Gear Live 2. When you’re exercising, be it at the gym or on the athletics track, you don’t want to be carrying around your smartphone in a pocket or leaving on the floor; they either become an inconvenience or you run the risk of breaking it. With room to place a SIM card inside the Gear S, you can reply to notifications and answer calls all whilst you leave your smartphone safely in a gym locker. Initially it sounds like a distraction, people want to work out to take a break from life’s alerts and connected technology. There are plenty of ways this could be useful though. For example, the Find Me Mode on the Timex Ironman One helps send out an SOS when a runner is in too much pain to continue. With the Gear S being on open source Tizen software, all it takes is an app to be designed to have a similar feature on the Gear S.
Speaking of apps, the Gear S has one huge weapon in its array to take on the best GPS watches. Now available on Tizen, the Nike+ Running app is the real deal for joggers rather than using the standard S-Health application. 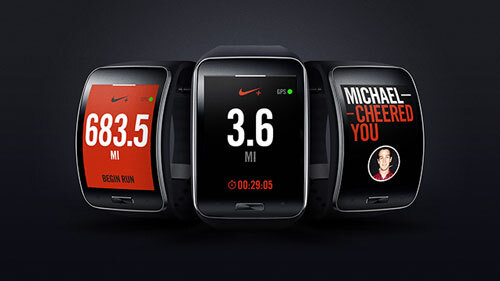 Pre loaded onto the device, users can track their distances and upload them straight to Nike+ from the watch, yes please! Because the watch has mobile connectivity, your Facebook friends can see how you’re doing on your run. They can even show their support and cheer you on, which in Real-Time will be sent to your watch, right at that point where you probably need a little motivation. As with past Gear watches and the Gear Fit activity tracker, the Gear S boasts a heart rate monitor on the underside of the device. Allowing you to take the pulse from the wrist, there’s no need to wear one of those annoying chest straps. For exercising, heart rate is a great metric for monitoring the intensity of your efforts. You can measure your heart rate within the Nike+ app too meaning you can correlate it accurately with your running speed gathered from GPS data. Also accessible through Nike’s app on the Gear S are your music playlists. With 4GB memory on the smart watch you should be able to upload a few headbangers to help keep you motivated during your workout. There’s no need to plug in headphones either as Bluetooth connectivity, lets you sync to your playlists wirelessly. And if you’re looking for a good pair of headphones that you can run with, Samsung just unveiled their Gear Circle, which are designed with exercise in mind. The ear buds even connect magnetically to each other when you’re not using them, so they can worn around your neck without dangling wires. With a high resistance to water and dust, you don’t have to worry about getting a little sweaty during your workout. The Gear S has a IP67 rating meaning it can even take a gym shower without frazzling out. It won’t be completely waterproof though, so I wouldn’t take it swimming or submerge the watch underwater for long periods. To get the most out of this watch, you’re going to need a Samsung Galaxy smartphone that’s running Android 4.3 or later. Though the watch can have its own sim card to relay you messages, you still need the Samsung Gear Manager app on your mobile to customise the watch and change settings. That said if you do have one of the compatible Samsung devices, you should be all set to enjoy this next generation smartwatch. You’ll be able to buy the Samsung Gear S after it gets released in October. With the Apple Watch available early 2015, you can be sure these two devices will be popular choices into the new year. It’s no coincidence Samsung decide to really step up their game just days before an Apple Watch is announced. Samsung are serious about wearables and know it’s going to be tough to compete against Apple’s reputation. With both GPS and mobile connectivity inside the Gear S, its a pretty exciting time for exercise enthusiasts. We’ve never had so much choice as to the watches we can use for achieving our goals. I’m particularly interested in seeing which fitness apps launch on Tizen over the next 12 months which will enhance the Gear S further.